Newspaper Clipping on Murray and the start of his music career. John Purves, a Night watch men at Jacktown Prison, was among the first prison reformers in the 1880s to introduce the idea that incarcerated peoples needed more than just punishments while in prison. Until then prison conditions in Jacktown and across the country had consisted of cruel punishments for the slightest infraction. In the collection of his watch men’s reports, The Night Keepers Reports, he explains that inmates need to also “aspire to be good” rather than just fear punishment for not adhering to strict rules within the prison system. 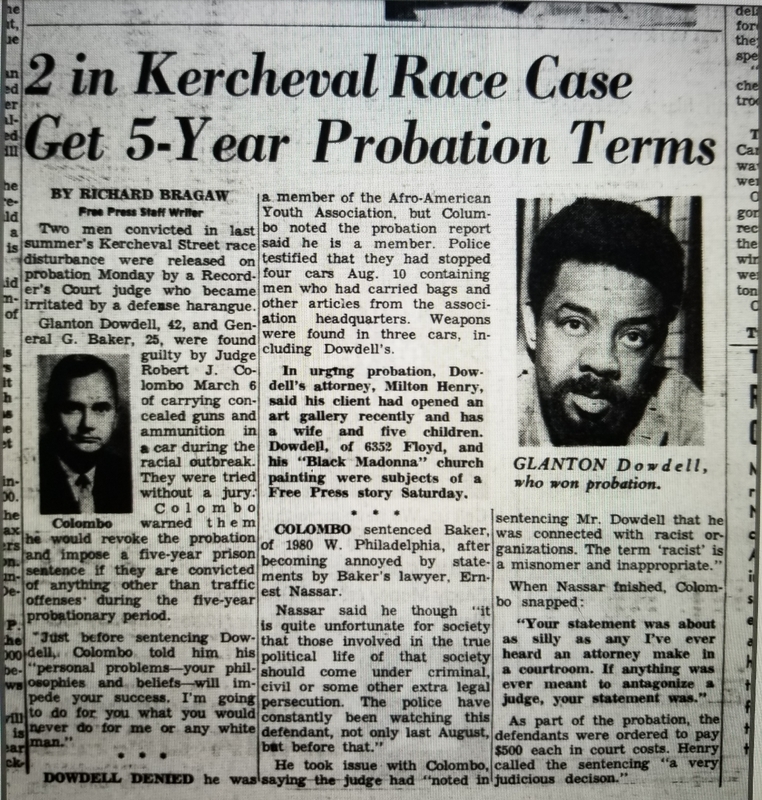 Later that decade, H.F. Hatch, a prison warden, would initiate educational programming in prisons under the assumption that lack of education and activity contributed to unrest amongst prisoners and punishable behavior. In 1933 Albert M. Ewert would bring prison recreational activities one step further by initiating arts education programs after being appointed Chaplin of Jackson State Prison. In Krasnow’s book about the prison he provides more details about Ewert’s views, “As chaplain, he truly believed that treating inmates with dignity and respect and giving them responsibilities and the opportunity for creative expression were the ways to return them to society as productive, useful citizens.” Ewert laid the groundwork for creative programming to be a consistent part of prison life in areas around Michigan and the country. Not only is this form of expression still available in the prison setting, but these works can also be used to express ideas about Prison life and the personal interests and needs of incarcerated people. Today, inmate created artistic practice is nurtured through volunteer programming and scholarly research. Art works can be bought by the public and incarcerated people can teach and learn a diverse number of art making methods including Painting, Drawing, Music, Theater, and more. On this page we will explore the prevalence of Arts programming today in the State of Michigan, highlight specific artists and works, and explore how through participation in these programs incarcerated people can resist the isolation of being in prison by expressing themselves through art. The mental stimulation offered through artistic working while in prison has a variety of impacts. In addition to the opportunities for creative expression, some incarcerated artists have also used art to communicate ideas about their experience in prison in relation to current events. Others have also kickstarted their art careers during their time in confinement and or gone on to complete notable works after their time in prison. Gilbert Murray for example took to composing music during his 7 years of confinement. He wrote 85 songs and when he was offered employment in the music industry upon his release from Jackson Prison. Another notable artist, Glanton Dowdell, was a Detroit activist who is most commonly known for his Shrine of The Black Madonna Mural in Detroit, MI. Dowdell’s 1960’s era painting celebrated Black womanhood in a church setting at a time when such things were incredibly uncommon and many other artists, like some of those highlighted in the Prisoner Creative Art Projects at University of Michigan, use subject matter like the Flint Water crisis to inspire their art today. In regard to more current and recent art programs within Michigan prison and correctional facilities, the Prison Creative Arts Project, (PCAP), is worth recognizing. The project was started by Buzz Alexander in 1990 at the University of Michigan with the hope to connect current and former incarcerated adults and youth with community members, faculty, and students at University of Michigan Residential College. Today the program is still successfully functioning with multiple programs and exhibitions that display the member’s artwork. One such program is the “Linkage Project” which through the PCAP, former prisoners come back into communities and collaborate with current incarcerated members through art workshops. Aaron Kinzel who works with PCAP through this program, understands this important by “knowing how empowering it is to get into contact with people from the inside that I’m a part of their culture”. In addition to workshops and programs within PCAP, the annual art show is considered the best feature of the program. The annual “Exhibition of Art by Michigan Prisoners” has been going on for 23 years now and uses various media of art with different levels of artistry from all 28 adult prisons in Michigan selected by curators and volunteers of the program. The yearly exhibit has provided a unique opportunity for participants to express themselves while acting as a form of refuge for them. Ashley Lucas, a professor in the Residential College at University of Michigan who currently leads the project, states that “there’s a lot of very casual remarks that say that we liberate people in prisons with the arts, that people feel free”. Through these programs and the annual exhibit to highlight the work from these programs, the inmates are given a chance to build a community amongst each other while instituting a positive activity that they would not be able to formulate themselves. Although the PCAP adheres to the standards of the prisons that they encounter, the project ultimately wants the incarcerated people to shape the end product of their various art forms with assistance rather than the project dictate the product. Through this collaborative effort between incarcerated members, University faculty, and volunteers of diverse experiences and backgrounds, some incarcerated people of certain clearance are given an opportunity to connect meaning with other members while also giving themselves a chance to grow intellectually, emotionally, and mentally within the incarcerated system. Krasnow, Judy Gail. Jacktown: History & Hard times at Michigans First State Prison. Charleston, SC: History Press, 2017, p. 134. Krasnow, Judy Gail. Jacktown: History & Hard times at Michigans First State Prison. Charleston, SC: History Press, 2017, p.136. Krasnow, Judy Gail. Jacktown: History & Hard times at Michigans First State Prison. Charleston, SC: History Press, 2017, p. 136. Detroit Free Press, March 6, 1941. Accessed September 28, 2018. “Prison Creative Arts Project” University of Michigan: Arts and Culture.